I am so loving this heat. You won’t ever hear a moan from me, however hot it gets. I’ve had my fair share of cold to last me a lifetime. My pace has slowed, my skin is glowing, my nails… I’ve actually got some. Bring on that Vit D, baby!! 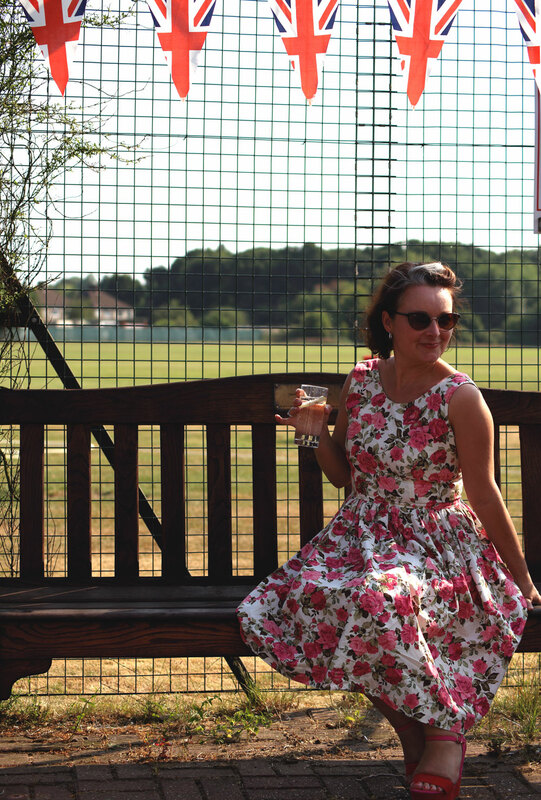 My only gripe – well it’s not even a gripe, really – is that I don’t have nearly enough summer dresses. It’s only ever been necessary to make 1 or 2 with such poor rubbish excuses for summers that we have. I had a lovely Email from a very dear friend last week, asking if I’d like to take care of his aunt’s sewing patterns and best of all his aunt’s beautiful sewing box. A no-brainer of course. The patterns, the box and it’s surprise contents are so deserved of their own post but what I do have to show you for now is the dress I ran up in haste this weekend for our lunch date with Nigel. I cut it out on the Thursday night, sewed it together on the Friday night (legged it down to the market on Saturday morning to get a zip) inserted said zip and hemmed it up before our lunchtime jaunt to a lovely converted cricket pavillion pub for lunch. In order for that kind of magic to happen I had to use a tried and tested bodice. And that of course is all credit to the lovely Elisalex pattern, brilliantly crafted by ByHand London. I replaced the skirt with a gathered rectangle using the full width of the 45″ fabric, and making good use of the selvedges to minimise neatening of so many raw edges! I’ve had the fabric in Stash Mountain for so long, it felt like the dress was for free too, which is always a bargain! Of course there were corners to be cut, namely a machined hem and I dodged hand stitching the bodice lining to the skirt seam. Don’t judge, just yet! This will most definitely be rectified as the complete sewing snob inside of me cannot stand to see that stitching. It’s just not right! I’ve got another in the pipeline too, using some lighter weight cotton in a red rose print. Only this time I’m going to take the sound advice of BHL’s FBA instructions and give the girls an extra inch! Is anybody else speed sewing for summer? When I got back home I had a good old rummage in that lovely old sewing box. It was hours before I came up for air! Not into vintage, or thought I wasn’t until I saw your lovely dress. Also liked your last drawstring top. Send over some sunshine to Sydney. I’m so cold I’m wearing my overcoat inside the house! Hoorah for speed sewing! I’m in exactly the same situation, it’s not that I don’t have dresses, I just don’t have sundresses without sleeves. I’ve speed sewn two recently! Oh so pretty and love the sound of a red rose version. Red rose anything gets my heart pumping! Here we are freezing and rocking rolling from earthquakes. Not loving the combination, I keep worrying that we’ll have to evacuate at night when it is soooo cold!! Thank you Mrs C. But how awful for you. Hope things settle real soon. I feel bad now, bragging about the sun. But hey, as you know, it’s a novelty round here! I love this dress! So much the essence of summer. And you look wonderful and relaxed in it. Oh I love that print – good rose prints are hard to find and that is scorchingly fabulous as a summer dress! 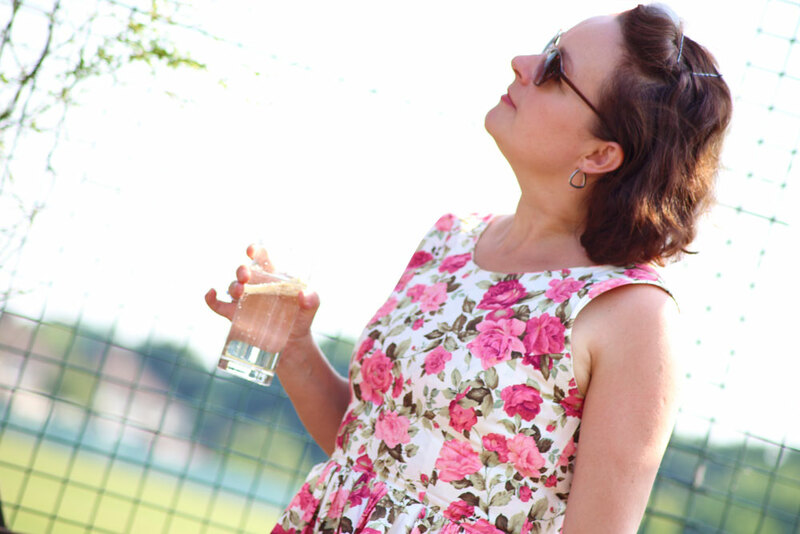 There is nothing so lovely as a summer dress that you can boast about- you look gorgeous- roses so become you! beautiful! i love it – i am also speed sewing – i think a hazel with a full skirt next! 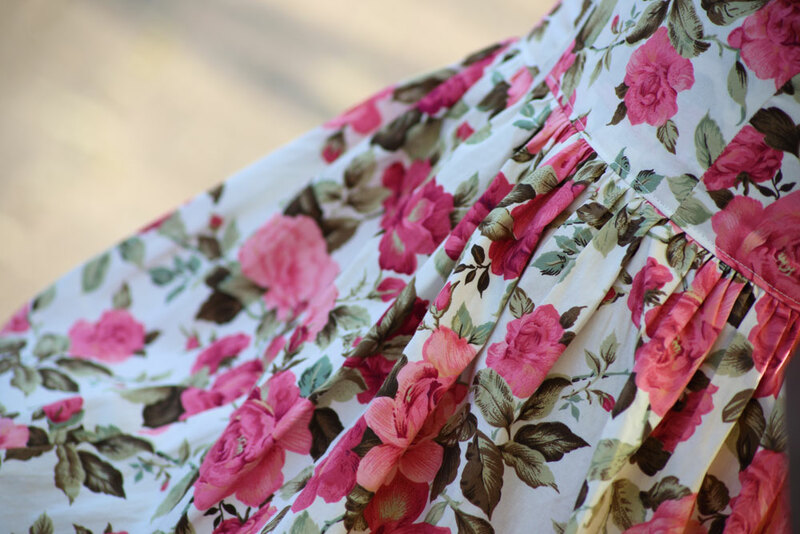 The rose print fabric is perfect for that dress! I’d never have guessed you put this together in a hurry. It looks wonderful. I hope you have fun sorting through your treasures and sewing more sweet summer dresses! Your dress is beautiful Janene, really beautiful! As for speed sewing…yes! I’ve made a summery Mathilde and just finished a Colette Hawthorn that I can’t wait to blog about! I love that floral and the dress fits you so well. What fun you must have had rummaging through that sewing box. It is always nice to see what goodies someone else has collected. def been speed sewing this summer. i’ve been trying to put a dent in my fabric stash and get some cute outfits ready for my vacation. feels so good to be cranking out a new wardrobe! Pingback: The dress that nearly wasn’t | ooobop! Pingback: For the love of lawn | ooobop!